Planning for the future takes effort, focus, and long-term thinking. For young women, saving for retirement can feel like either sacrificing present experiences for future opportunities, or feel so far off that present and more pressing financial needs take precedent over future savings. As part of the POPSUGAR Insights 2017 Personal Finance Report, we surveyed nearly 2,000 women between the ages of 18 and 44 to ask them how they manage their finances and think about their financial future. 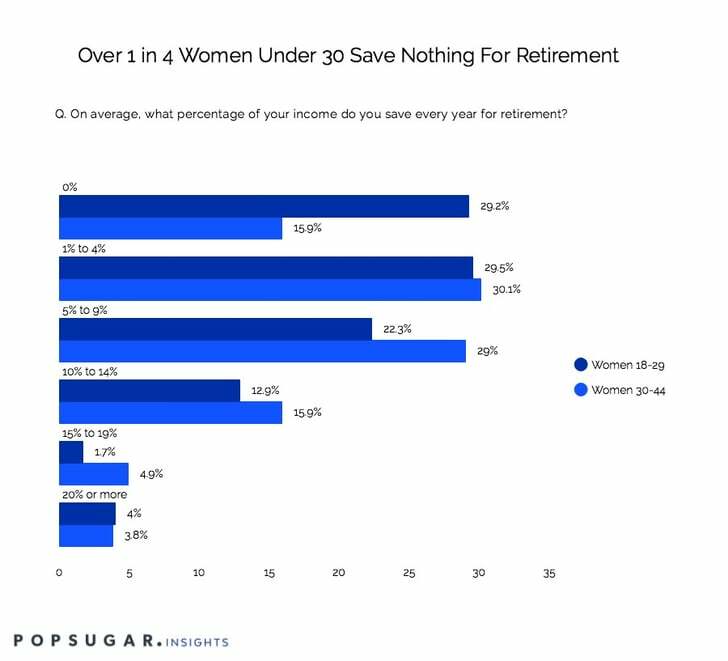 Amazingly, 29% of women under the age of 30 save nothing for retirement, and 59% save less than 5%. Women under the age of 30 are 83% more likely to have nothing saved for retirement. Additionally, only 3 in 10 women of any age are saving between 1-4% of their annual income for retirement, meaning that even among those that are saving, retirement savings does not seem to be a financial priority. Opportunities for brand marketers include not only stressing the importance of savings for the future, and creating savings strategies to ensure success, but also to have a better understanding of their retirement savings options, both within their company-offered plans, but also via individual investment options. Overall budgeting could be an important education topic as well, so women know how to "pay themselves first" and prioritize retirement savings while not sacrificing short-term needs and goals.